When it comes to vitamins for eyes and macular degeneration the most important study is the Age Related Eye Disease Study (AREDS). The Age-Related Eye Disease Study (AREDS) was a 10 year study of 3500 people with AMD. "taking high levels of antioxidants and zinc can reduce the risk of developing advanced age-related macular degeneration (AMD) by about 25 percent." "the AREDS formulation, while not a cure for AMD, may play a key role in helping people at high risk for developing advanced AMD keep their remaining vision." Currently, there has been evidence suggesting that adding omega 3 to the AREDS formulation may further reduce the risk of developing advanced age-related macular degeneration. Infact, in 2006, the Age Related Eye Disease Study 2 (AREDS 2) was piloted. This study adds omega 3’s to the AREDS formulation, and replaces the beta-carotene with lutein and zeozanthin. It is a phase III study with 4,000 participants that is ongoing but it is not recruiting new participants. The estimated study completion date is June 2013. 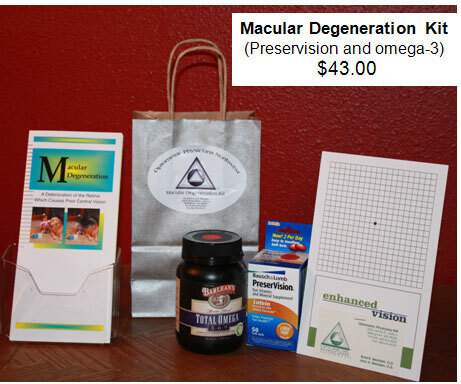 We feel that the initial evidence of adding omega-3’s are so compelling that we have proactively added them to your macular degeneration kit. The first line of defense for macular degeneration is awareness. A simple test of your vision will alert you to any changes that may indicate a problem with macular degeneration or a worsening of your condition. This common test is known as the Amsler Grid. The Amsler Grid looks like graph paper, with dark lines forming a square grid. One of the first signs of macular degeneration can be wavy, broken or distorted lines or a blurred or missing area of vision. The Amsler Grid can help you spot these early. Early detection of wet AMD is critical because treatment, when indicated, is most successful when performed before damage occurs. Since dry AMD can lead to development of wet AMD, most patients should use the Amsler Grid. Check with your eye doctor to find out how often you should use this test. Measure (or have someone else measure) a distance of about 16 inches from your eyes to the screen. As you notice the horizontal and vertical lines in your periphery, ask yourself the following questions as you check each eye separately: Are any of the lines wavy, missing, blurry, or discolored?